“Changes for the Better.” Mitsubishi Electric’s corporate statement describes more than their work with clients: it describes their internal processes. “There’s not a lot of leading-edge technology across the cooling and heating industry,” notes Chris Osment, Director of IT at Mitsubishi Electric. “In our organization, we needed to elevate 240 sales associates—plus our distribution partners—from the 19th century into the 21st.” Inconsistent documentation – “from spreadsheets to faxes to napkin sketches” – made visibility into the sales pipeline difficult. Quoting was slow, and sales couldn’t keep up with customers’ demands for rapid quote turnaround. Mitsubishi Electric needed a modern quoting solution. Mitsubishi Electric’s commitment to “changes for the better” drove them to adopt Salesforce. Partnering with Simplus to streamline their quoting process and increase collaboration with distributors, Mitsubishi Electric launched a Partner Community using Salesforce Community Cloud and Salesforce CPQ, bringing product information, partner certification, self-service quoting, and lead registration to a single platform. Sales quote cycle times dropped by more than 90 percent, and approval time dropped from two days to two hours. Prepare to redefine the way you (and your colleagues) work. As you approach a CPQ implementation, recognize that it won’t be as easy as replacing a single system with a new one. The bigger a company is, the more differentiated processes become. A single task can vary drastically in execution depending on geography, route to market, and line of business. So before you throw a blanket over the entire enterprise and tell everyone how to do their jobs, take stock of how they’re doing jobs right now. Make sure to identify differences in work practices and rationalize them. Otherwise you can end up adding a lot of unnecessary complexity to your software, limiting the efficiency benefits you are striving for. Here’s a phrase to expect: “What we’re doing now works.” If they aren’t saying it, you can bet your employees are thinking it. It’s the natural response to change. Some may even try to compromise by adopting the new technology but using it to replicate the old way of doing things. But that won’t do. You need to help them recognize the chance to do some performance spring cleaning. Tech cycles last about five to seven years; every time a new tool hits, it’s an opportunity to define a better way of working and refine the market. Are you in a similar position? When every quote has to go through the same process, you need to be careful that you’re actually reducing risk, not just adding more work. When approvers are faced with a mountain of quotes, they are much more likely to start giving approval without any real analysis on their part. In our experience, the majority of pricing approval processes change very few quotes, adding little to no value at all. Empower your salespeople to do their own work. 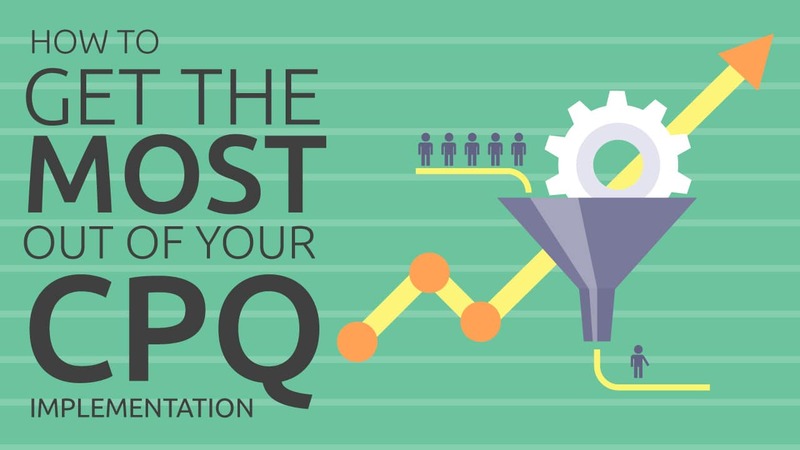 An efficient CPQ process decreases the number of people who have to get involved in quotes. You want to keep it limited to the people who are already working on making the sale and who will be responsible for keeping your customers happy: your sales team. By extending self-service capabilities to your sales reps, you allow the people who are actually selling your product to create their own quotes. “Why would they want to do that?” Consider this: selling never goes in a straight line, and there are always changes that need to be made. If they have to ask for changes from someone else, days stack up. Your sales team may end up spending too much time stuck in approval purgatory as the deal slips away. But give sales reps the tools to create their own quotes, and they can stop acting as middlemen. They achieve a level of independence they haven’t experienced before. A good CPQ solution, properly implemented, liberates your salespeople. You may very well encounter some pushback. Have your salespeople grown accustomed to calling someone in another department to prepare quotes for them? If so, preparing quotes on their own will feel like extra work. They may gripe that you’re placing bigger burdens on them. That’s a natural first reaction, and you can get past it. It will be your job to sell your sales team on this new process. You need to convince them that you’re all working together to streamline the work. You need to paint the picture for them that they will be able to quote faster and more accurately, close more business, and increase profits. And you need to believe this yourself; otherwise, your people—whether they’re direct sales reps or channel partners—will never buy it. You have what it takes to make changes for the better and transform your company, beginning with your quote turnaround time. We’re here to guide you through your CPQ implementation, from redefining the way you work to streamlining your processes, and from empowering your salespeople to selling them on your vision. Change can be scary, but we’ve been there. Simplus is ready to see you through.